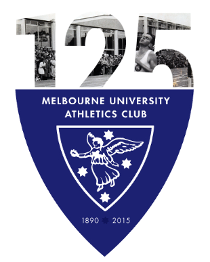 Round 2 of Shield Competition was a successful one for MUAC, with competition first at the Rawlinson for the Pole Vault, followed by a quick move to Williamstown for the rest of the events. Warren’s Pole Vault squad dominated the competition at uni, with Irie Hill and Anthony Hanna winning their respective events. Kath Iannello and Jacquie Sharples took the top two points scoring positions in the Women’s and Jack Ingram took the top point scoring spot in the men. After a quick dash across the Maribyrnong to Williamstown, competition continued on a mild October day. Paul Kennedy made it two wins from two with a fine effort in the 2000m walk. Sophie Barker showed some good early form to come second in the 1500m. Kath Sutton leapt into third in the high jump with Emil Gundesen and new MUAC President Stephen Edwards sharing second in the Men’s High Jump. Recent recruit Joe Cosgrave overcame a early wardrobe malfunction to hurl his way to third in the javellin. The Women’s 4x100m team of Kath Sutton, Cath Manners, Emma Doyle and Erica Lane ran well to come second. 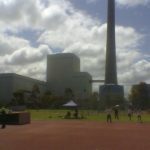 The looming presence of the power station was obviously unnerving for some, as MUAC athletes stepped outside their comfort zones to do an extra event or two. Many points were scored for the club but few were given for style. Putting a distance runner anywhere near starting blocks is not a good idea.